Hello! Welcome to this blog! I am a custom-built teardrop trailer. My creators, Sue and Mark, built me from scratch in Fall 2011. 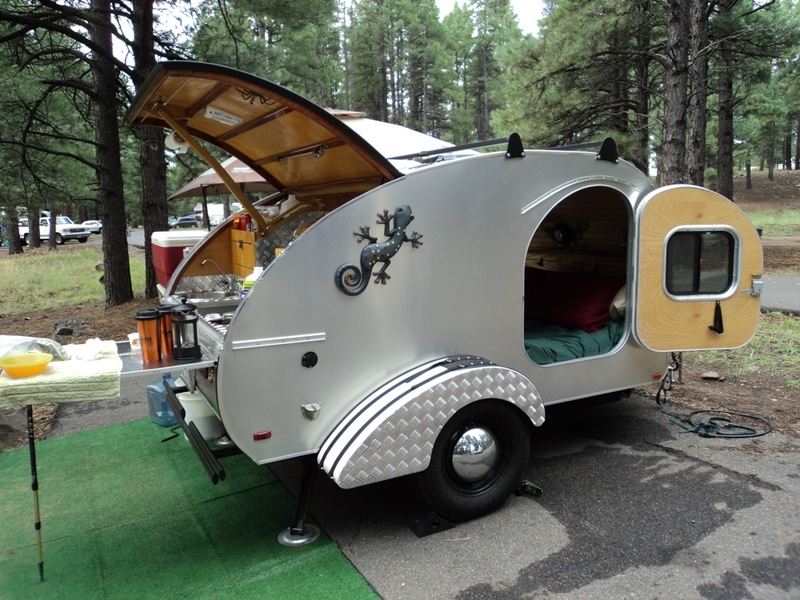 If you haven’t yet been introduced into the world of teardrop trailers, you’re in for a treat. We’re pretty neat. We’re lightweight, compact, and make traveling with some creature comforts nice and easy. If you can stand up in it, then it’s NOT a true teardrop! Since Sue and Mark started traveling with me, they’re like a couple of kids. We’re always taking off on last-minute trips because I’m easy to tow, pre-packed, and ready to go! Sue and Mark also take a lot of trips without me (Sniff! Sniff!) so you’ll hear about those adventures as well. 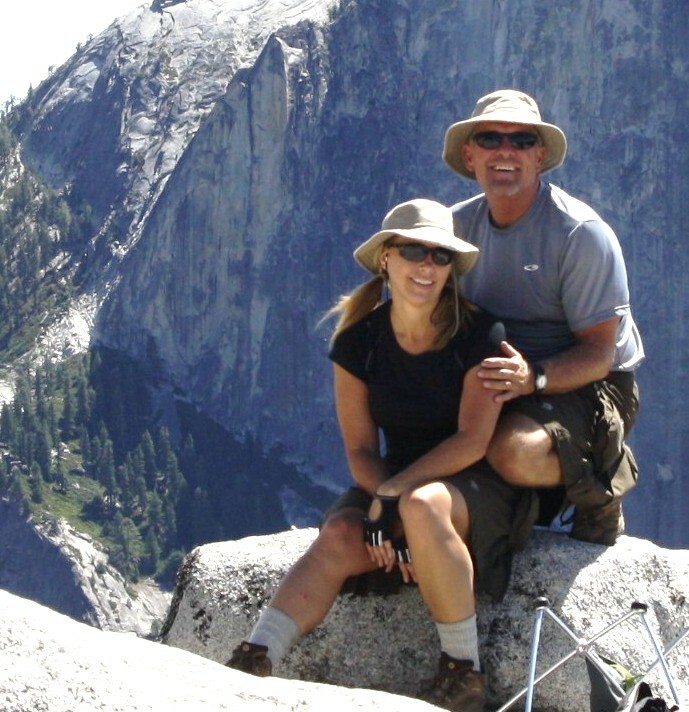 Both Sue and Mark are nature lovers and outdoor enthusiasts. Sue is a writer and also the creator of this blog. Generally speaking, she is a creative soul who dabbles in jewelry making, music making, and merriment making. She loves DIY projects, especially if it relates to restoring and/or re-purposing something. Recently, after 6 years of blogging on this and her other blogs, Sue has become a published writer–initially by accident, and thereafter by sheer effort. She has written and had published . . .
and yet another true short story in the book, Chicken Soup for the Soul: Step Outside Your Comfort Zone (2017). Here, in this corner of the Internet, she uses her words and her photographs to chronicle our travels together, our love of nature, the quest for life balance, the cool people we meet, the cool things we see, and anything else that appears on this site. She’s been a camping enthusiast ever since childhood and has a thing or two to say about what camping used to be compared to what it is now. “It’s changed!” she says. Sue has one other major passion and that is making jewelry. She’s been doing so since around 2008. See the menu tabs on the main page of this blog to check out where her creative mind takes her in that realm. She loves making Handmade Nature-Inspired Jewelry and also delves into many special projects, including One-of-a-Kind Handmade Heirloom Jewelry. Mark has long been a backpacking enthusiast (and a professional parachutist in a previous life). He is fabricator of things made of wood and steel–“Wood is good, but steel is real!” he likes to say. He’s also been known to fabricate quite a few tall stories around the campfire! He has a lot of experience and information to share about being prepared when enjoying the outdoors, which Sue sponges from him and passes along to you whenever it applies to the topic du jour. 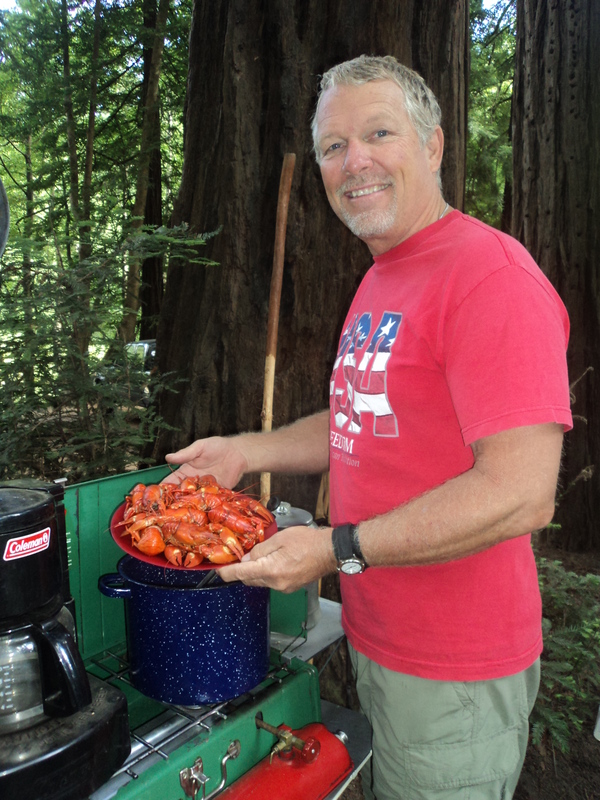 He also is highly capable in a camp kitchen! FOLLOW US and you’ll hear about the places we’ve been and the wonders that await you when you’re outside playing! Nothing is quite as inspirational as being out in nature. Nothing so easily restores balance in an otherwise hectic world than getting away from it all and getting down to the basics. Come along for the ride, and you may find something you can take home with you–whether that be nature-related jewelry . . . travel, camping, and hiking (/backpacking) tips . . . a renewed sense of gratitude for simply being alive . . . ideas inspired from other teardrop trailers . . . possibly even a bit of armchair wisdom about life. Sue and Mark’s main goal is to get outside as often as possible and hopefully encourage you to do the same. And if that happens to inspire you to respect and learn how to preserve the stunning national parks and wildernesses in this country and around the world, then that would make Sue and Mark even happier. Nothing makes humans feel and act more human–in a GOOD way–than getting back to their roots . . . back into NATURE. But many people don’t understand the importance of being out in nature, because they already suffer from NATURE DEFICIENCY. 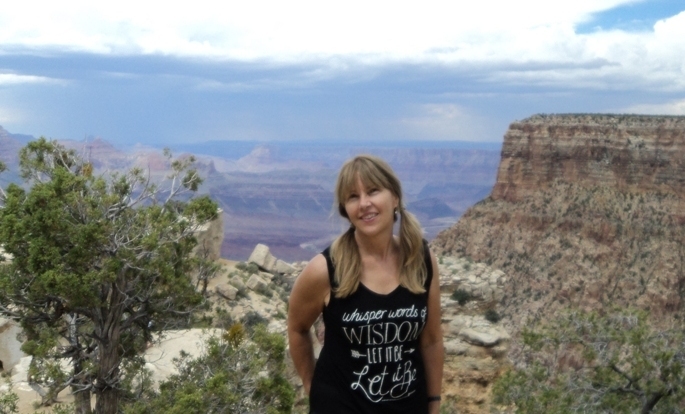 Sue and Mark hope, in a very humble way, with this blog as a tool, to inspire more people to get out and RECONNECT WITH NATURE. Sue and Mark think teardrop trailers make camping more palatable for more people who traditionally dislike or have slowly tired of tent camping. Teardrop trailers = More People Camping = A REALLY GOOD THING! Who knows . 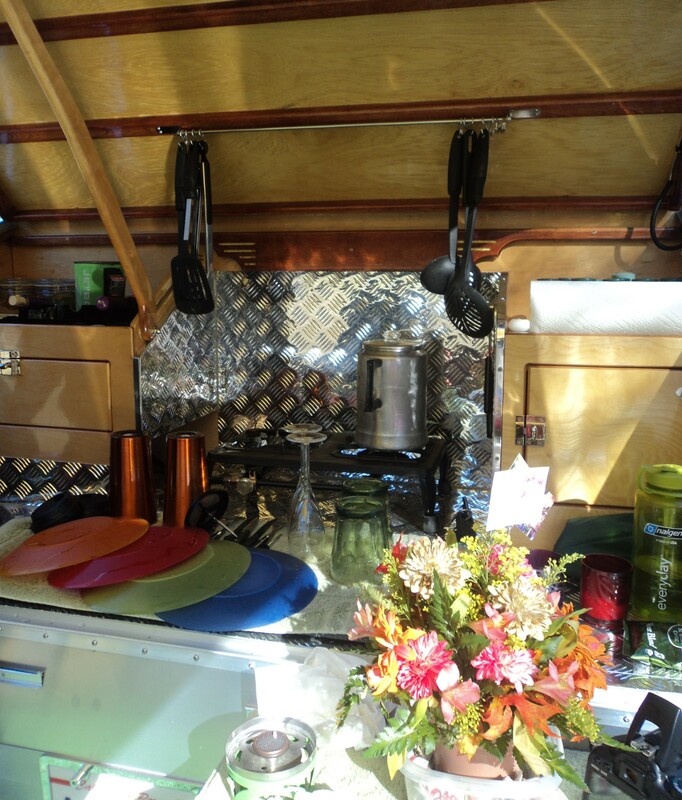 . . maybe Sue and Mark’s adventures will inspire you to build your own teardrop trailer, or restore something old until it seems new again, or re-purpose some useless item so that it’s useful again. Sue and Mark do a lot of that DIY stuff. You can too! It’s all about keeping life as stress-free as possible. And it can be. You’ve just got to keep it simple and enjoy the little things–like me, a tiny teardrop trailer! Wow! Thanks, Cliff! Great info. IRG looks great! We’ll certainly be making our rounds at other gatherings now that we’ve been inaugurated at Perris. So many nice people, and the rigs were all unique. Loved it! SO happy to be a new follower of this beautiful space you have created. Looking forward to following your adventures. Was a pleasure to meet the two of you @ Lost Dutchman Park and enjoyed your story regarding the trailer. Glad you could join us for dinner and our campfire sing-along. We had a great time! Nothing like kicking back to a top-notch guitar duo after chowing down on an excellent pot luck dinner. Thanks for including us in your group. We’ll definitely sign up on the Meetup group you all are a part of, so we can do it all again sometime! i am a member of the teardrop group on FB. Wow! Sounds like quite an adventure, Lauralee! We’ll have to see where we’ll be when you’re coming through. I’ll check around and see if there are any teardrop gatherings in Arizona this spring.